“We don’t know the reason for the death of fish in downstream villages,” Hamberton Nongtdu, a mine owner from the northeastern Indian state of Meghalaya, told me. Behind him on a rickety stage were nearly 50 mine owners from the region. Behind us were nearly 20,000 miners, family members, and supporters of the coal industry, waiting with black flags flapping in the wind. On the eve of an historic election in May, videographer Michael Miller and I visited Meghalaya to explore how this restive coal-producing region is dealing with growing energy demand while balancing environmental impacts and searching for more broad-based economic growth. Our intent in planning this film for the “Global Choke Point” project – an original reporting collaboration between the Wilson Center and Circle of Blue – was to document the lack of environmental regulation in a region experiencing a massive increase in coal production. By spending time with miners, journalists, and community members, we hoped to tell the various stories of people impacted by the industry. But two days before we set off for northeast India, a new judicial body, the National Green Tribunal, changed things dramatically: They announced the first-ever state-wide ban on a fossil fuel industry anywhere, targeting all coal mining in Meghalaya. The result is our new short film, Broken Landscape: Confronting India’s Water-Energy Choke Point, which documents the frontlines of one of the most consequential contests between energy, water, and livelihoods in the world. Black, flinty piles of coal riddle the countryside as you drive through Jaintia Hills – a local hub for buying and selling in Meghalaya. On any given day, hundreds of ornately decorated trucks flow through depots, bringing coal from local mines to be sold and loaded for delivery. It’s difficult to know who is buying or selling given all the activity. In the distance, soot-covered young men load large pieces of coal in rock crushing machines that wobble furiously while chugging plumes of grey smoke. This scene plays out across much of India. Growing energy demand in this country of just under 1.3 billion has led to rolling blackouts, and even as scientists warn of the danger of burning more fossil fuels, coal remains the fastest and easiest way to fill the void. Lack of infrastructure, rail capacity, and primitive mining practices have stalled domestic coal production in recent years, however, and in Meghalaya, illegal and frighteningly simple mining techniques, like “rat-hole” mining, have flourished. 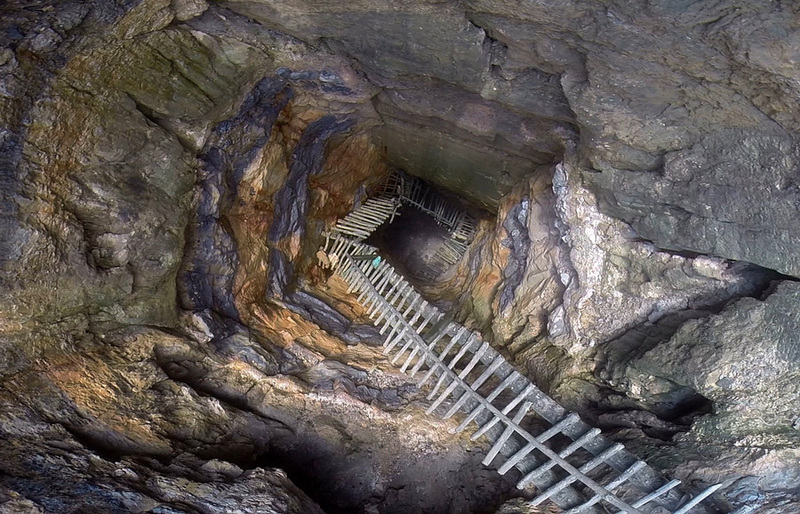 The risks miners take climbing into a rat-hole mine are clear once you’ve seen one. Descending down the branch steps that circumnavigate a 20 or 30 meter-wide shaft, the cold, damp air is full of the sound of falling water and axes plunking away on rock. Small holes dug into the sides of the central shaft serve as tributaries to coal veins. Miners use little more than a headlamp, pick axe, and basket to haul coal out of these tunnels, and the extraction method can wreak havoc on the geology of rock and soil above, causing the earth to collapse and trap miners. Our guide, Helpme Mormen, is a reporter for The Shillong Times, where his stories on the rampant but narrowly consolidated economic growth from coal and the dangers of rat-hole mining have made him a target of mine owners. “Less than five percent of the people in the coal mine area really benefited from the mining,” he told us. Compared to the large three- and four-story homes of the mine owners, living conditions for the miners were humble. Nishant slept in a crammed bunk with up to 14 fellows under a blue tarp roof, earning $8 to $10 a day, based on output – the variable rate encouraging him to work as quickly as possible. Rat-hole mines have transformed this once agrarian state both economically and environmentally. 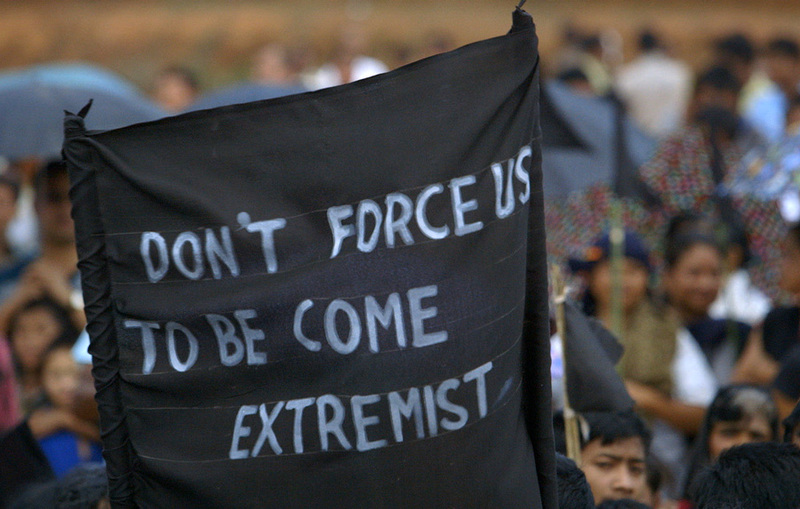 When the National Green Tribunal enforced their ban this spring, they were responding to a formal complaint by the All Dimasa Students’ Union and Dima Hasao District Committee on behalf of communities living downstream. Some of the rivers and streams in these communities are dead, harboring little natural life and turning a dark amber color. Kip Amtra does not seem like a man who would purposefully poison these rivers – especially not near his lifelong home, Kharkhana Village, just five kilometers from a coal production site and near the border with Bangladesh. Kip serves as an elder and informal village historian. “We used to sell fish by the boatful,” he told us. “They were easy to come by in those times.” The Myntdu River was clean and full of life before mining, he said. It’s a very different story from the mine owners and their supporters, who spoke mainly about jobs and livelihoods. Coal is threatening the environment and the lives of his neighbors, Kip says. Men are falling ill, the water stinks of rotten flesh, and all of the fish have died off. Visiting Kharkhana, it’s easy to make a connection between the environmental destruction there and the pillaging of the earth just kilometers away. But as the region relies more on coal production and less on agriculture, mine owners have consolidated political and economic influence. Between the first day of the ban and our first day filming, nearly a week transpired, giving mine owners a chance to organize and hone their message. Nongtdu and the other owners agreed to be interviewed about the ban only at a rally of their supporters. “We don’t know the reason for the death of fish in downstream villages,” Nongtdu reiterated to us on the platform above the seething crowd. But the message was clear: we do know that these tens of thousands of people are losing their livelihoods in the meantime. The halt in production meant absolutely no activity was allowed. The depots sat desolate. Migrant workers like Nishant could not work. The same ornately decorated trucks passing through before numbered in the tens rather than the hundreds. The only activity was soot-covered young men working the rock crushers. As of now, the ban is still in place (though according to Keith Schneider, who returned to the area this fall, sporadic activity is taking place). Mine owners have been encouraged by the Tribunal to outline a plan for regulation but have instead organized an indefinite strike on all economic activity. Riot police were called to quell demonstrations against the ban in September, which ended in the deaths of two civilians. Many migrant laborers like Nishant have long since returned home. Meghalaya’s clash between coal and water is a microcosm of a much larger predicament on the sub-continent and around the world. As the largest and most populous democracy, India faces a pivotal time. Aspirations to follow China’s path of muscular economic growth have been tempered by poor access to energy. For new Prime Minister Narendra Modi, who came to power this year with a hefty mandate for change, increased coal production is at the center of plans to modernize and grow. From 1992 to 2012, India more than doubled its energy consumption, an increase that closely mirrored economic growth and rapid industrialization over the same period. 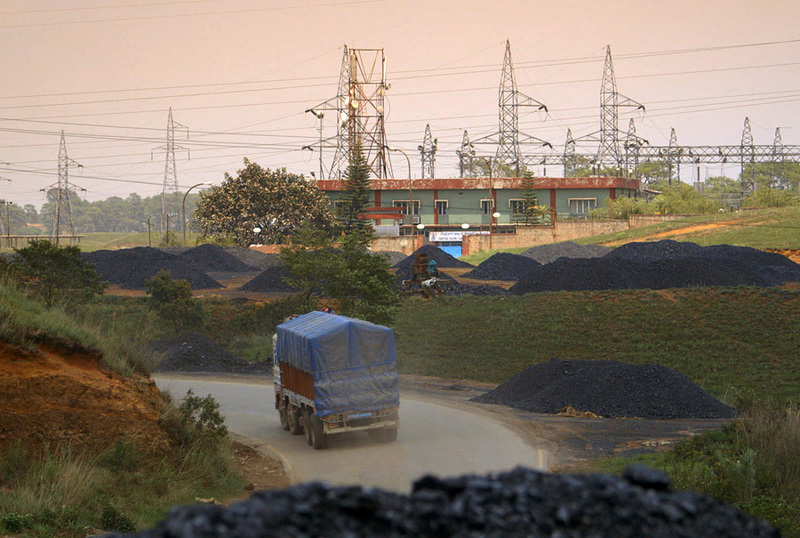 But since 2012, domestic coal extraction has stalled and India’s economy has dipped from nearly nine percent growth annually to between four and five percent. India sits atop the world’s fifth-largest coal reserves and Modi has said he wants to do more to tap into them. His stated goal it to more than double coal output, to 1 billion tons a year, by 2019. But the methods of extraction used in places like Meghalaya are devastating the environment, endangering workers and nearby communities, and bringing little visible prosperity to surrounding areas. At the moment, those regulations do not seem forthcoming – either from industry or government, leading to stalemate. How India – and other developing countries in similar circumstances – balance these costs and benefits will be tremendously consequential for the world. Edited and designed by Schuyler Null. Film and Photo Credit: Michael Miller/Think Out Loud Productions and Sean Peoples/Wilson Center. Thank you for sharing our story to the World.